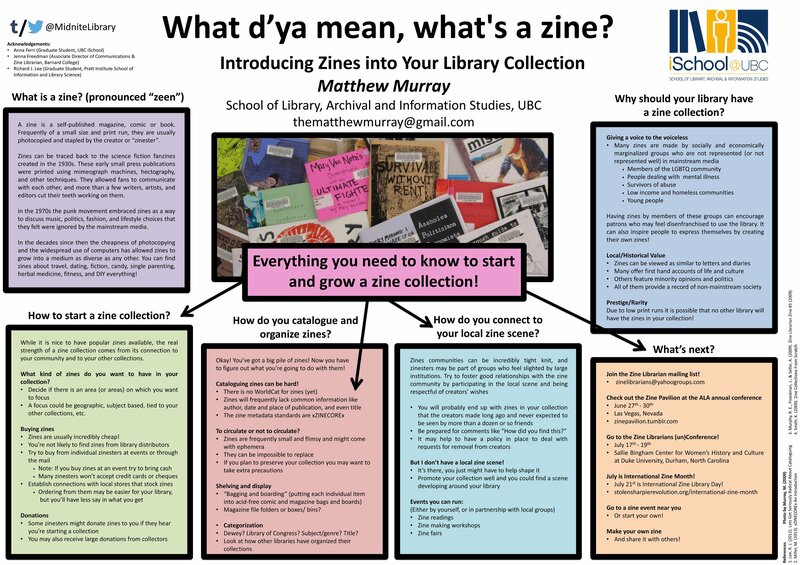 A zine is a self-published magazine, comic or book. Frequently of a small size and print run, they are usually photocopied and stapled by the creator or “zinester”. Zines can be traced back to the science fiction fanzines created in the 1930s. These early small press publications were printed using mimeogprah machines, hectography, and other techniques. They allow fans to communicate with each other, and more than a few writers, artists, and editors cut their teeth working on them. In the 1970s the punk movement embraced zines as a way to discuss music, politics, fashion, and lifestyle choices that they felt were ignored by the mainstream media. In the decades since then the cheapness of photocopying and the widespread use of computers has allowed zines to grow into a medium as diverse as any other. You can find zines about travel, dating, fiction, candy, single parenting, herbal medicines, fitness, and DIY everything!